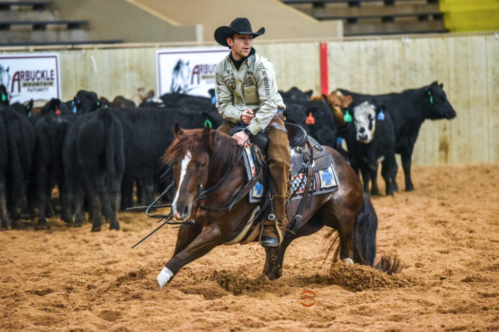 Congratulations to Adan Banuelos and Lone Oak Performance Horses on their recent win at the 2018 Arbuckle Mountain Futurity with Miss Stylish Katz, by High Brow Cat! Adan marked a 223 on the mare to claim the Open 5/6 Championship title. Miss Stylish Katz, aka “Nikki,” is a dynamic mare out of Miss Stylish Pepto that has made numerous finals during her show career. She placed 5th at the NCHA Super Stakes last year, and has earned more than $70,000 to date. Mr Luckys, also by High Brow Cat, finished as the Open Reserve Champion at the Arbuckle Futurity with million-dollar man Matt Gaines. The two cut first out and marked a 221 stake claim on the honors. Mr Luckys is out of Reys Desire by Dual Rey and is owned by longtime owner and breeder, Jim Vangilder. Other Open finalists included Spud Sheehan and Call Me Catniss, who finished in 4th place with a 219.5, and Phil Hanson and Cattomatic, owned by Kelly and Donna Graham.